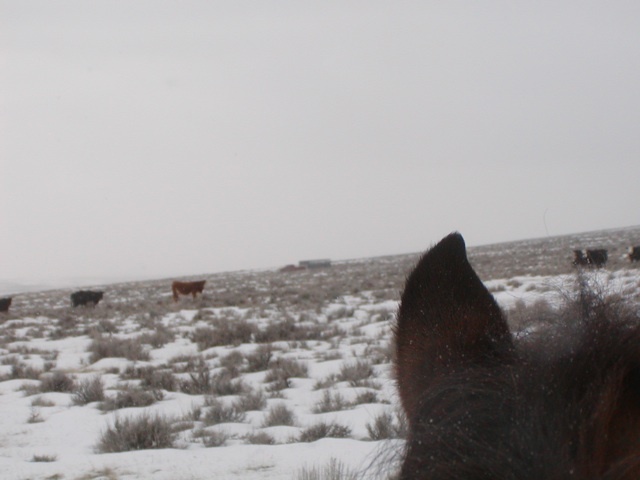 We began gathering our cows off the BLM today with our neighbors that share the allotment. I am sore from hunching up against the snow even though it was very light and a fairly nice day. I took my hot shower and I’m ready for bed, but, of course, have to post these OOPE photos first! 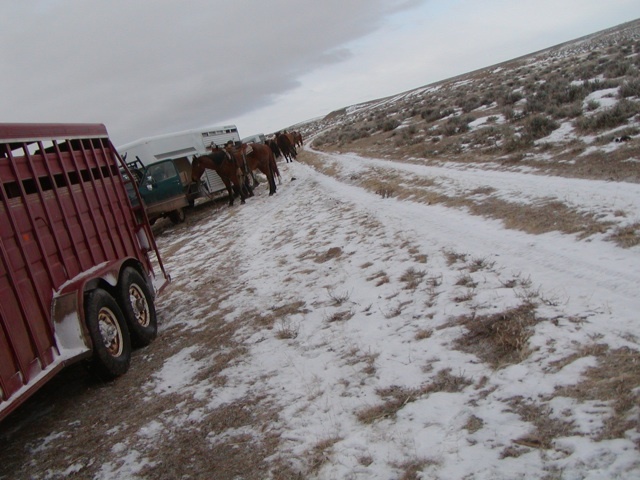 Four pickups and horse trailers and 11 people and horses. The neighbor’s dog, Spike, and Lucas start the day with a big fight. It continues 2 or 3 more times throughout the day… each time Lucas holds his own, even though I figure he’s the weaker dog. Blood spatters are on both dogs. That’s the problem with having a stud dog! Vernon and Johnny approach my little bunch with one of their own. This was a good time to let Lucas rest. He did OK today… it wasn’t hot! 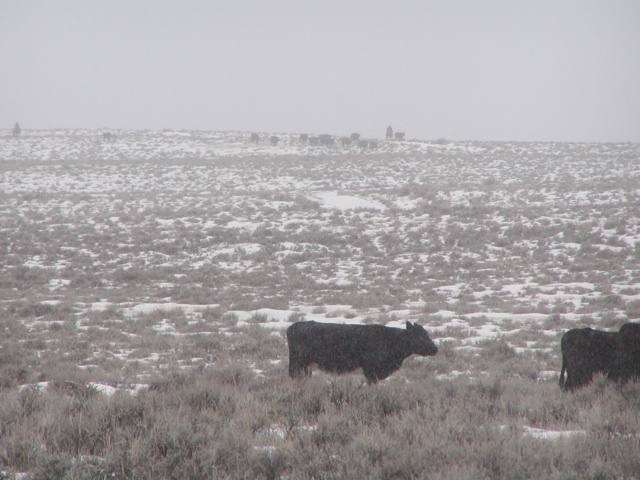 the snow wasn’t deep, the cows traveled well, he had snow to “drink”. 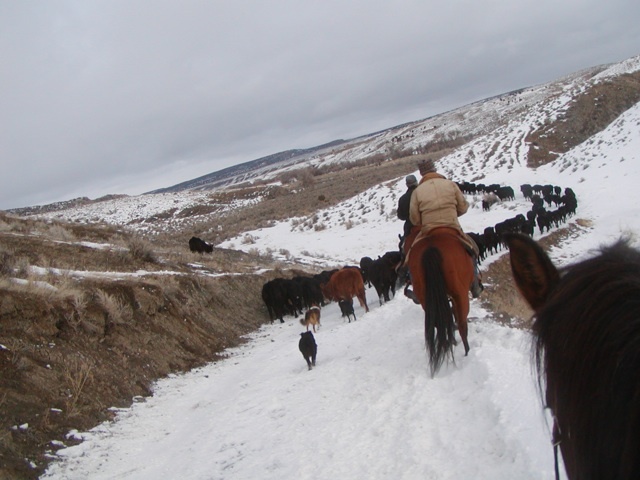 The cows trail across Bruner Draw with little encouragement. We are “duding” it… traveling single file because the road – though covered with an inch of new snow – are really ice rinks and the footing is better alongside the edge of the road. Tart kept wanting to walk on the road, but the way the cows were sliding I was definitely NOT going there! We ride again tomorrow, to hopefully gather the rest… we ended up with 99 today, so we have many more to gather! I’m headed for bed… I’ll try for more OOPEs next time!